The reddish polar patch on Pluto’s moon Charon is visible in this image, which was taken by NASA’s New Horizons spacecraft on July 13, 2015, from a distance of 289,000 miles (466,000 kilometers). The north pole of Pluto's big moon Charon likely gets its reddish color from radiation-altered shreds of Pluto's atmosphere, scientists say. Charon's surface is dominated by water ice, and the 750-mile-wide (1,200 kilometers) moon is mostly a solid grayish-white as a result. But Charon also harbors a reddish polar patch, which was discovered by NASA's New Horizons spacecraft during its historic Pluto flyby this past July. On Pluto, the tholins are probably created when galactic cosmic rays and ultraviolet (UV) light from the sun interact with methane on the dwarf planet's surface and in its atmosphere. Something similar is happening on Charon, and it involves Pluto material as well. Charon is incredibly cold, with yearly temperatures at the poles ranging from minus 433 to minus 351 degress Fahrenheit (minus 258 to minus 213 degrees Celsius), researchers said. So the Pluto gases that reach the moon's surface freeze directly into solid form, bypassing the liquid phase. Reactions involving cosmic rays and UV light then turn much of this material into tholins, which have a lower sublimation temperature and therefore can stay put even when the north pole is in sunlight. This theory is backed up by laboratory work here on Earth, which has produced tholins in conditions similar to those experienced in the Pluto system, researchers said. 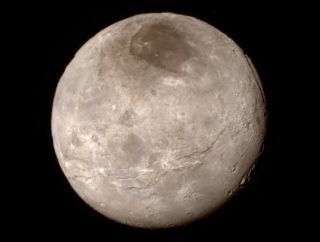 "Charon likely has gradually built up a polar deposit over millions of years as Pluto’s atmosphere slowly escapes, during which time the surface is being irradiated by the sun," New Horizons team member Carly Howett, a senior research scientist at the Southwest Research Institute in Boulder, Colorado, wrote in a blog post Wednesday (Sept. 9). Tholins come in a variety of colors, and mission scientists aren't sure why red variants are favored at Charon, Howett added. "This is one of the many things I am looking forward to better understanding as we receive more New Horizons data over the next year and analyze it in conjunction with continued laboratory work," she wrote. "Such an exciting time!" While New Horizons beamed home some images and measurements shortly after the July 14 flyby, the probe stored the vast majority of its data onboard for later transmission. That relay work began in earnest over the weekend; the entire flyby dataset should by on the ground in about 12 months, mission team members have said.